يقع فندق McLaren Vale Studio Apartments، المصمم ليناسب كل الضيوف سواء كانوا من رجال الأعمال أو السياح، في مكان ممتاز في أحد أكثر المناطق تفضيلاً في مكلارين فال. يمكن من هنا للضيوف الاستمتاع بسهولة الوصول إلى كل ما تقدمه هذه المدينة النابضة بالحياة. يوفر الفندق بفضل موقعة الجيد وصولاً سهلاً إلى أهم معالم المدينة.
. إن الخدمات الممتازة وحسن الضيافة العالي في McLaren Vale Studio Apartments تجعل إقامتك تجربة لا تنسى. لضمان راحة ضيوفه، يقدم الفندق الخدمات التالية: تسجيل دخول/خروج سريع, تخزين الأمتعة, ركن للسيارات, مرافق للشواء . بالإضافة لهذا,تتضمن كل غرف الضيوف مجموعة واسعة من وسائل الراحة . بعض الغرف توفر حتى تلفزيون بشاشة مسطحة, حوض الاسترخاء, غرف لغير المدخنين, مكيف هواء, تدفئة لإرضاء أكثر الضيوف تطلباً. يقدم الفندق مجموعة رائعة من الخدمات كمثل حوض الاستحمام, حديقة، لجعل إقامتك تجربة لا تنسى. إن كنت تتطلع إلى إقامة مريحة وهادئة في مكلارين فال، فستجد في McLaren Vale Studio Apartments بيتك الثاني. A comfortable bed,great little kitchen . Enjoyed the complimentary chocolates and bubbles but would have liked the wifi connected.Location is very central with a few restaurants close by. Although only an overnight stay, this was just perfect. This accommodation has everything if you are looking for a comfortable well equipped home away from home while travelling. Located in a quaint town, with tasty restaurants and close to vineyards, 40 minutes south of Adelaide or 40 minutes north of Victor Harbour. 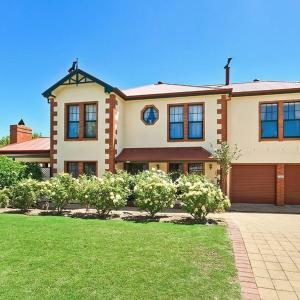 This is a great location for making your travel comfortable and with easy access to major highway while exploring Adelaide or the southern region. Easily recommend this accommodation! An excellent place to stay, the location was perfect. Easy walking distance to some lovely wineries and restaurants. Very welly maintained apartments, roomy, spa bath, carparking, backyard patio and fantastic kitchen and washing facilities. We stayed in a one bedroom apartment. Good selection of choices, IE; Bring groceries to cook your own meals for a night in or stroll to the Chinese restaurant next door or to a hotel only a short distance away. Staff very polite and accommodating. Highly recommend to others. If you are looking for a wedding or party venue try our Kuipto Hall. Splendid rural setting. Or take the opportunities to visit the great wineries in the region. Enjoy! We were in the apartment that was on the road frontage which was very noisy. On arrival we had to phone a mobile # and then wait for the lady to call us with the lock box details. The apartment was poorly presented, very unclean in areas, dark and generally in bad condition. We departed the next day to an wonderful B&B. It is not value for money. As the complex is for sale clearly the care factor has gone. I recommend you don’t represent them. We have never complained about accommodation so please don’t take this lightly. Great location, everything you need, no complaints whatsoever. Would stay again! It was a great place to stay. Great spacious layout. Self contained. Clean, Complimentary wine. Friendly staff. Foxtel. Comfy lounge and theatre seating. Downside - the bed was really hard.